“Oh, we’ve been here a little over a year,” I told a new friend. The words flew out of my mouth and shocked me. A year? It’s been more than a year since I said goodbye to all my piano kids and locked the door of that dear little house on the hill? Since visiting my favorite grocery stores and restaurants? Since I sat in church, choking back tears hearing Psalm 33, “The earth is full of the steadfast love of the Lord“? I can remember those details like they were yesterday. But that means everything since then has been squeezed into a year: immediately knowing we picked the right doctor, and seeing that tiny heartbeat – Annie! – on his office’s ultrasound screen; transforming this house Aaron picked out into a home; sharing a rich life with new friends here; having Annie here and starting life with her. Has it really only been a year? Some people don’t ever really move, living in or near their hometown for most of their life. I never expected to be one of those people, which has been handy while Aaron’s academic career takes us on a slow tour of the midwest. It’s been a wild ride, but we started gearing up for this when we were dating and discussing the future. Aaron and I kept track of how many times we noticed God sending, calling, or taking people away from their families or homes in scriptures. The examples are numerous: Adam and Eve leaving the garden, Noah creating a new home after the flood, Abraham’s journey to the promised land, Jacob, Joseph, Moses, exiled nations, Mary and Joseph, the apostles, etc. Based on these patterns, we determined to look first at what we thought God wanted us to do before considering what might keep us close to our families. For better or worse, the Lord seems to have taken us up on that commitment. It was exciting to discuss this as star-crossed lovers with dreams of adventure and children and California, but real life hits like a freight train: Besides no babies and no California, we discovered that moving is often (rightly) considered one of the most stressful life experiences a person can go through. You could discuss this in clinical terms – most of the “experts” rate it right up there with a serious illness or a divorce in the amount of stress it creates. It usually means every detail of your life changes, for better or worse. But when you go through it yourself, it isn’t clinical at all. It’s personal. It’s a transition into shocking unfamiliarity in all aspects of life, and ripping up those roots of home is a profound loss no matter how well you prepare for it. 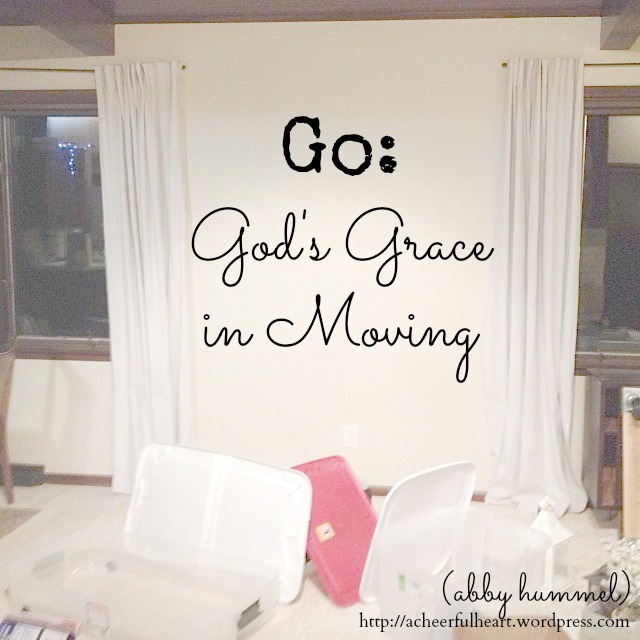 Is it easy to look only at the hardships of moving? Yes. They are numerous. But if I have to move again (and, spoiler alert, I would not be shocked if it happens twice again in the future) I don’t want to look back on a few years with several moves as “a season of hardship.” Life is hard enough as it is. I want to be able to focus on the gifts that come with moving, because they are there, and I don’t want to miss those blessings. Moving means sacrificing close relationships. After growing up in one place, then spending four years in college, and six years in Iowa, I know a lot of fabulous individuals. It’s not possible to maintain the intimacy of as many friendships as I would like. But I built those friendships because I found wonderful people where I lived, which will happen again wherever I am, and I can’t imagine what a loss it would be to have missed out on knowing any of them, even though I had to trade proximity of old friends to meet the new ones. Moving also means that I am overflowing with relationships, and at 28 I already know and love more friends than some people have in a lifetime. Moving challenges our finances and possessions. Since we have never had any moving expenses covered – but maybe someday they will be!? – this has made significant impact on our budgets and spending in less-than-enjoyable ways. At the same time, moving has forced us into more brutal decluttering and less collecting, which cultivates a more sane life in other ways. Some people are naturally anti-junk and easily cut out extraneous material, but Aaron and I are both the sort of people that need that forced upon us. Moving has also loosed the grip on our bank accounts and our stuff. Maybe the biggest grace in moving is understanding more firmly that nowhere on earth was ever meant to be my permanent home. Not a beautiful lighthouse on Lake Michigan, proud college halls liberally educating under magnolia trees, familiar couches jammed with siblings, small town charms in Iowa, or a neighborhood full of fast friends in Minnesota. Learning to love these temporary homes and embrace everything that comes with them is a great picture of Jesus’ sacrifice to come from eternity into time, to give himself away for people in a place he would stay only a while, and leave only through suffering. The whole Christian life reflects this in the continuing process of being oriented towards permanency in the midst of what is passing away. 2 Corinthians states this quite plainly: … the things that are seen are transient, but the things that are unseen are eternal. I think that becomes more tangible when it’s experienced in the process of moving and resettling. All of this being said, I do not anticipate moving during this calendar year – for which I am extremely grateful. LOVE this! After 5 moves in 4 years, I have to say I agree with you on both accounts: the immense stress and immense blessings a move can bring. Moving away from our hometown in our first year of marriage brought my husband and I together in a way that nothing else could have–it forced us to move past our family feuds and selfishness and support each other. Moving has indeed expanded our horizons, as I now think fondly on all those different people and places. Most importantly, moving has given me the confidence to understand that home (cliche alert) really is where the heart is–and it’s not in your stuff. Our last cross-country move involved taking only what our tiny car could carry, and I can’t say how liberating that was. Wherever we go, whatever we do–I know that God will be with us. Kudos to you, my friend! Thank you for this page. I dBm MoVing from my home of 40 years and I know I can do nothing without God.